And I did! I am nothing if not determined. Okay, perhaps I’m a recovering perfectionist, but let’s just say determined. It sounds nicer. I am in the business of PR after all. We know how to spin. Take Miss A’s over-tired meltdown last night for instance. She was being assertive and independent, not bossy and stubborn. It’s just a matter of looking at the bright side (and helps keep us sane after 20 minutes of screaming). Now the bright side to my failed Romanian recipe, as many of you noted in your comments last time, is that the prep pictures for that flubbed dessert were already done. All that was left to do was to cook. So this afternoon when Mike took the kids to the library, I took advantage of the empty house. 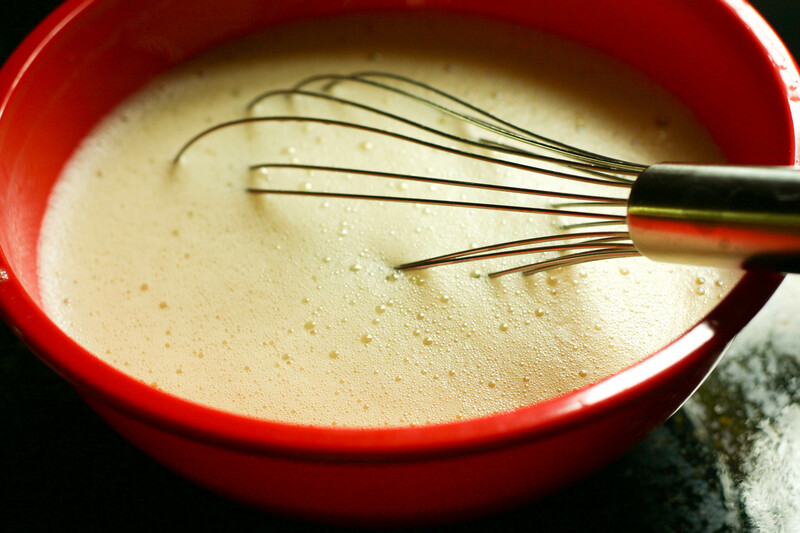 It was time to rock this recipe – Crema de Zahar Ars, or Caramelized Sugar Cream. The dish, basically a Romanian take on flan, was suggested by one of Mike’s students who is a native Romanian. 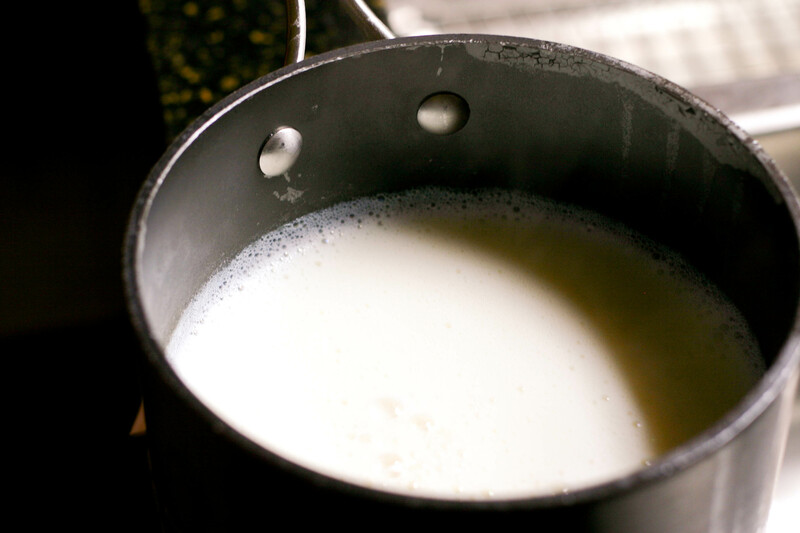 So for take two, I started by boiling some milk, salt and vanilla (last time I did not boil the milk). Once that reached a boil, I removed it from the heat and set it aside. 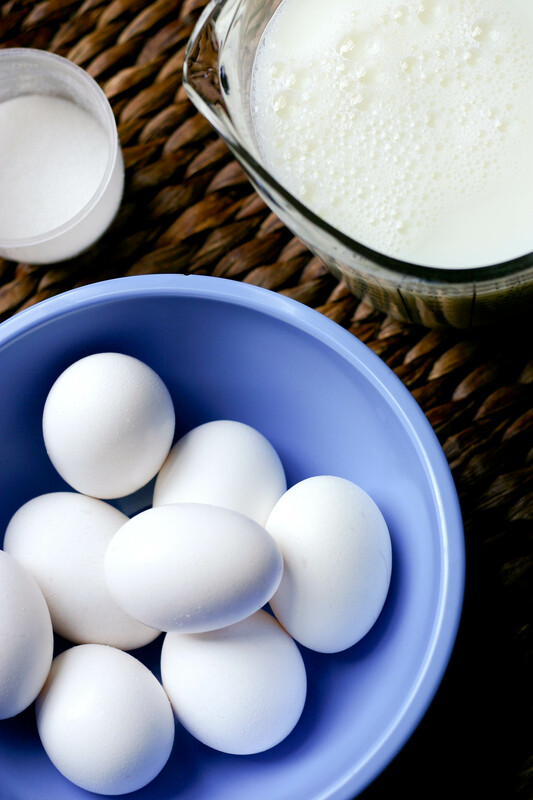 I then whisked together some eggs and sugar. 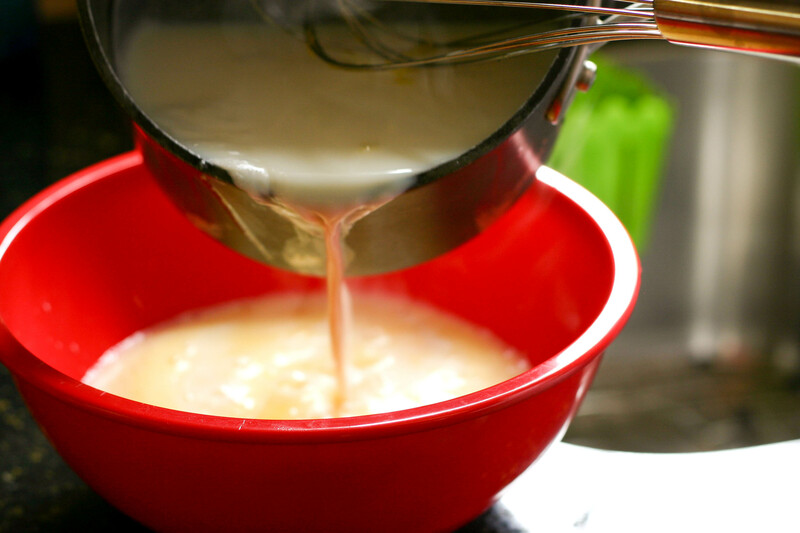 Next, while whisking continuously, I slowly added the milk to the egg mixture (last time I mixed the milk, eggs and sugar all together straight from the fridge). Then I kept whisking until the cream cooled. 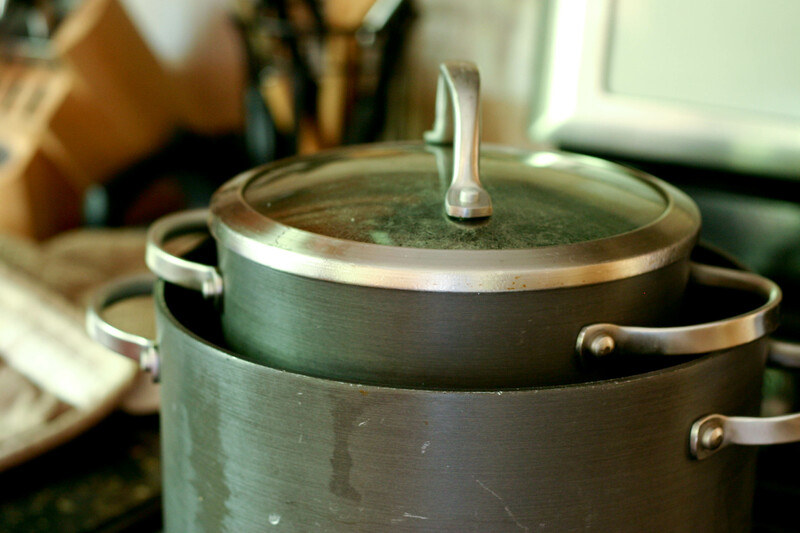 Once cooled, I set the cream aside and started two pots on the stove. 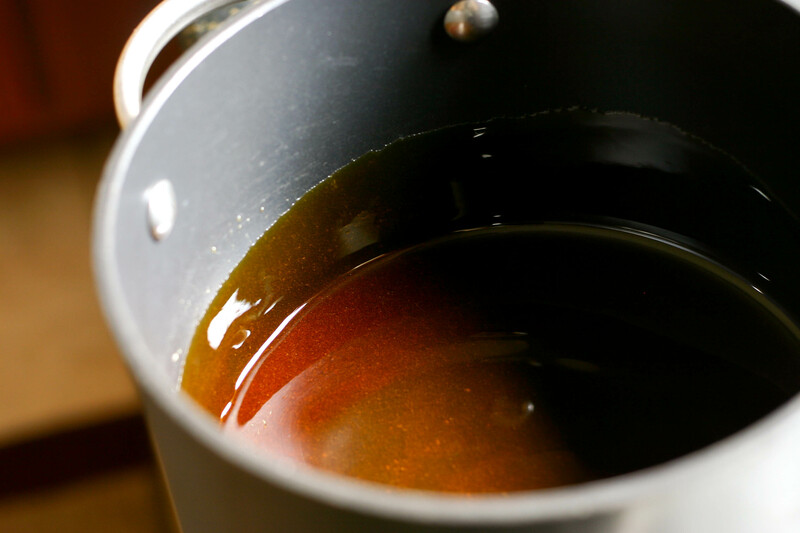 The first, a 3-quart sauce pan with 3/4 cups of sugar. The second, a 5-quart pot with water. Now this part is my favorite. I love, love, love watching the sugar melt. It takes me back to doing experiments in chemistry. 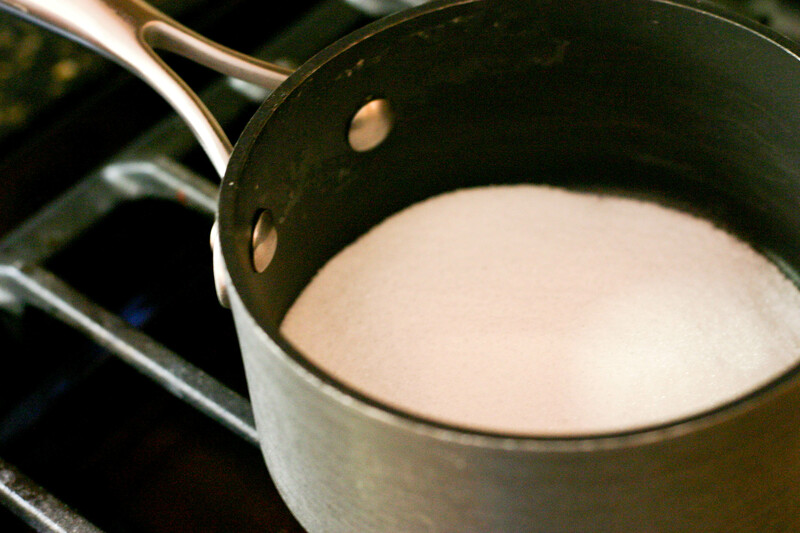 I had no idea sugar could just melt without a liquid in the pan. It’s just gorgeous to watch. Oddly enough this was the part of the recipe I was most nervous about, having never just stuck sugar to melt on a stove, and it ended up the only part of my first try that went right. The kids thought this was really cool too (They were around to watch the first time around.). Once the sugar was melted and golden brown, I swirled it to coat 1/3 of the way up the sides of the pan until it set. Next I whisked the cream a bit more and poured it into the 3-quart pan over the caramelized sugar. I baked the sugar cream for an hour at 325F. At this point the cream still jiggled, but also had pulled away from the sides of the pan. I stuck a knife in the cream as a final test and it came out clean. The cream had set! I left the sugar cream in the water bath to cool for about an hour. Then I removed the sugar cream pan and placed it in the fridge for a few hours. Finally, when it was time for dessert, I covered the pan with a plate and inverted it to release the sugar cream. Voila! My inner perfectionist was satisfied. I didn’t even care what this tasted like. I did it and it looked darn gorgeous. Mike was seriously impressed. So how did it taste? Well, Mike is a big fan of flan. 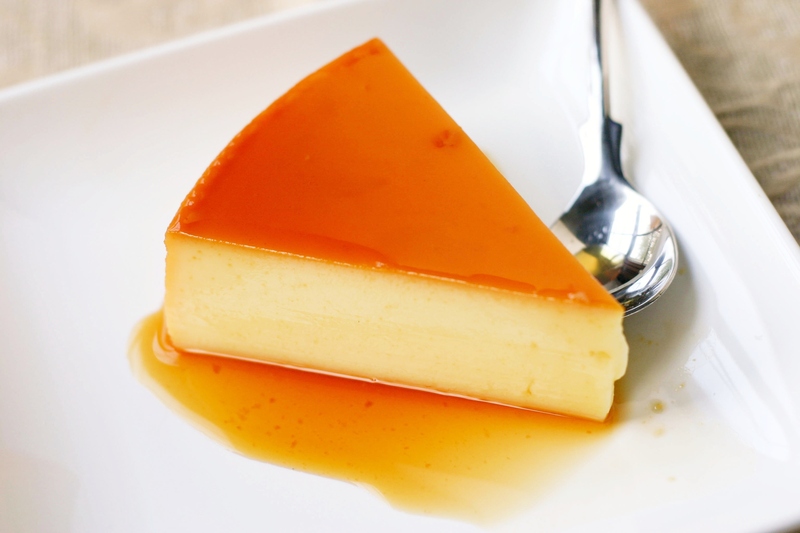 A flan fan. So he had high hopes for the Crema de Zahar Ars and much to my immense satisfaction, this lived up to his expectations. He gave it a definite and resounding 4 spoons. As for the kids, Mr. N described this as a French toast pie – a rather fitting description. He was torn between 2-1/2 and 3 spoons. He said it was good, but not something he’d want to eat every day. Miss A loved the caramel sauce, but didn’t like the cream part of the cake, so she gave two rankings. The sauce came in at 4 spoons, the cream 1 spoon. I’m wondering if it was a taste or texture issue for her. So I’m not sure if it was boiling milk, mixing the eggs and milk slowly or the water bath that made the difference this go-round. Perhaps it was all three. All I know is that I did it and darn it, it felt good. And good I felt, until I started a small fire tonight. Oops. I was making pizzas with Linda’s pesto, tomato, shallots and Parmesan and tossed the two pizza pans on the stove top to cool. A corner of the parchment paper apparently got a little too close to the flame under the toasting pancetta and whoosh! Fortunately I was able to blow the flame out. Now my initial reaction was, “Duh! That was careless!” But of course we can spin this too. It was clearly just the universe’s way of keeping me humble and reminding me to slow down. It obviously wasn’t my fault. Ehem. For the record, the pizzas turned out great – 4 spoons all around. Happy 4th of July to all our American readers. We’ll be back Saturday with our anniversary dinner (and perhaps a peak at the shoes ladies – and Greg). Cheers! Looks great! Good job. 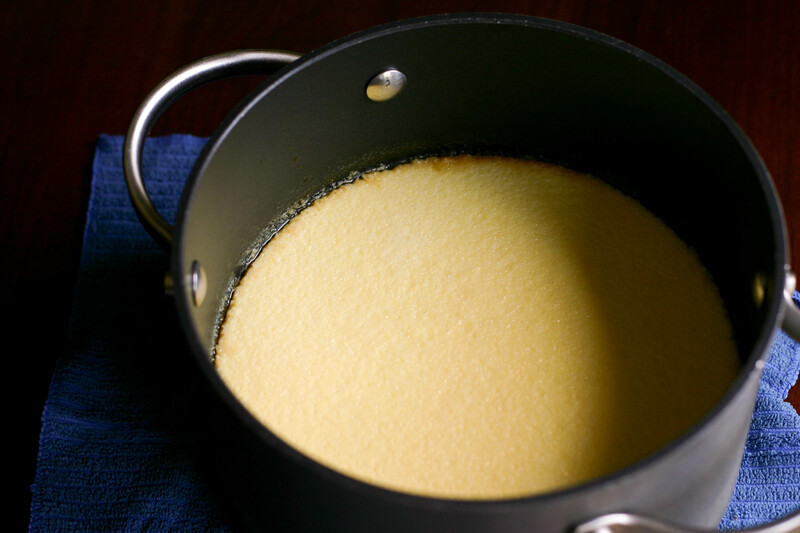 I’ll be posting a similar flan making experience on my next blog posting! Esta receta esta muy bien además muy bien esplicada. OoooOOOhhh Kristy, this looks so so SO major in the delicious dessert department! It was so entertaining reading about your mis-steps and false starts.. especially when I see you triumphed in the kitchen in the end!! It is gosh-darn pretty.. 4 spoons for beauty and since I love a flan.. I’m sure I’d give it 4 spoons for flavor. I always think of that television show where Alton talks about the science of things.. if only I understood more of that stuff, I think I’d make fewer mistakes? Hope you had a wonderful 4th of July!! ahh gorgeous pictures! and, fantastic-looking recipe. thanks for sharing! 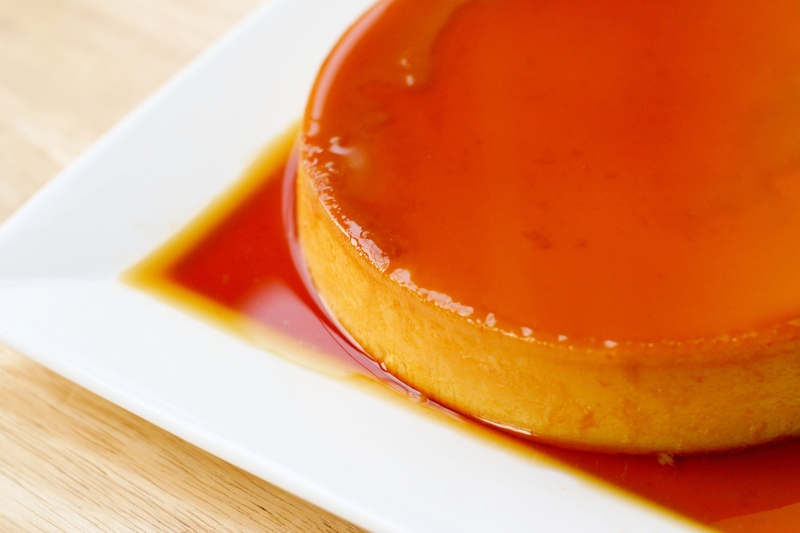 I’m not a huge flan fan (kinda fun to say haha), but this looks and sounds amazing. Second times a charm, eh? Glad it got 4 spoons after all of your hard work! Looks gorgeous! Hah – sorry about the fire… that may have happened to me a time or two. 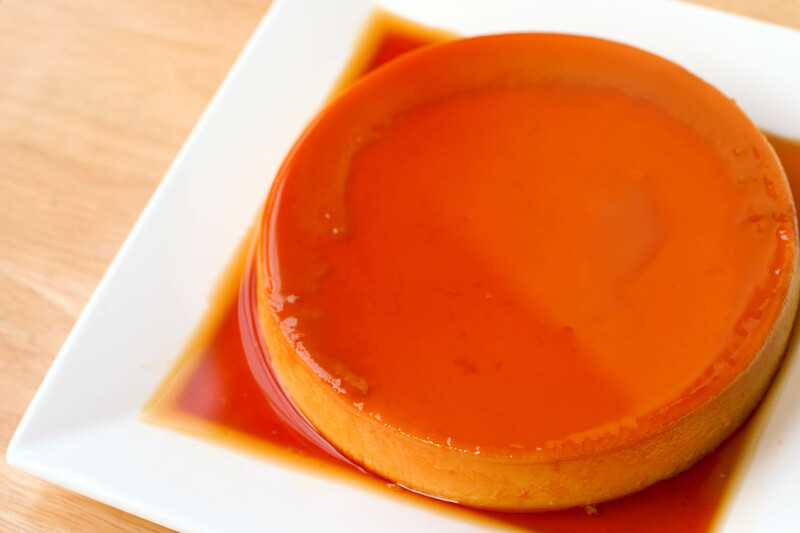 🙂 And like you, I’m not a huge flan fan (also the texture), but this might make me change my mind. So glad you got it to work! Love that you tried again – and based on looks alone, I think it would have been a perfect score from me!! From the look of it…I would rate it 4 spoons. I don’t normally swear or anything but when I saw your PERFECT fan, word just came out. SO BEAUTIFUL. It’s flawless, Kristy. You are not “recovering” perfectionist, you still are perfectionist!! Gosh I can finish this entire flan with a serving spoon. Seriously. Looks wonderful! 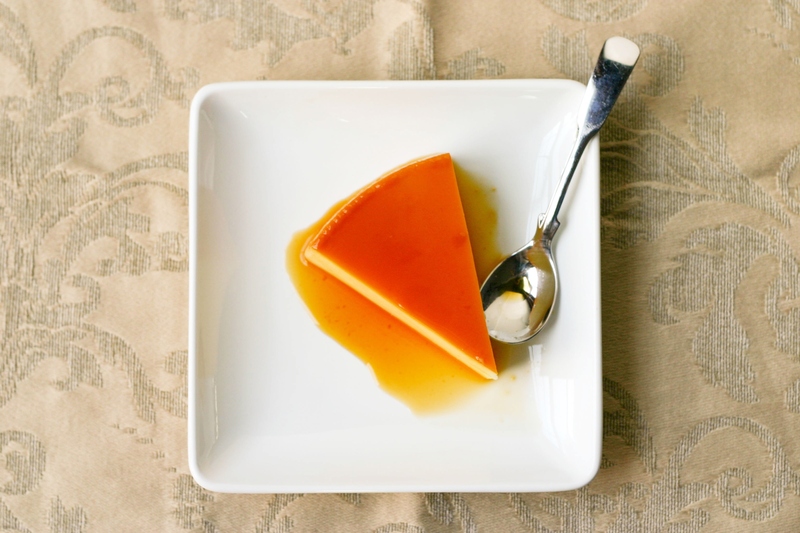 My husband loves flan, which is a common dessert in Brazil. However, I’ve never made it for him 😦 Maybe I’ll surprise him with this sometime! Love the pictures, as always! Haha, spin is where it’s at! And I’m sure glad you are a determined young woman – just look at that golden gorgeous flan! I feel like bouncing off a trampoline and diving right into its soft, luxurious contours – so inviting!! :). And its got some great depth to it too – just look at those hearty slices…what a success Kristy and good for you for sticking to it! Happy 4th to you and family – I’ll be thinking of all my American friends enjoying delicious food and good times barbecuing in the great outdoors… (that’s the image I have in my head anyway of the 4th :)). Happy 4th! Look forward to a shoe report with shots from different angles! That is seriously lovely! Looks a hundred percent professional. I’ve never had a flan before; to me it looks more like Crème Caramel. Looking forward to the shoes post. As rsmacaalay mentioned it looking like a Filipino thing I’ll chime in with another one too – Crème Caramel, although I think that’s much more squishy… like a solid custard, as opposed to a flan. This looks like a massive success – I’m so glad it turned out successfully the second time around. So creamy and perfect in consistency – great job Kristy! hehehe I loved the “recovering perfectionist” , guilty as charged. I keep telling myself I need to spin things off too. My son had a huge meltdown this morning, I think looking at it as him being independent would have helped. That would definitely taste so good! God, it reminds me of my grandma… she use to make it. I still remember how everytime she use to make it we kids use to just eat this..
Now that’s some dessert, Kristy! Well done! I love how it appears to be floating on a sea of caramel. But how did you get it out of the pot? I would have been afraid it wouldn’t have come out evenly and folded onto itself — or something equally bad. Instead, you have a perfect-looking dessert. I hope you all have a great 4th, too! Kristy – that is a piece of art!! I completely know that feeling of making something and having it turn out so beautiful, it doesn’t matter one bit what it tastes like!! That definitely looks amazing though…I wish I had some right now. Happy 4th, and let’s hope we can break 70 tomorrow! I love the look of this. It seems so firm and wonderfully creamy, I bet. My mom never made this so it’s a new dish to me as part of the Romanian repertoire. I’ve made flan, of course, but never one that stood so tall. … oops, I meant pork crackling biscuits and cheese biscuits.